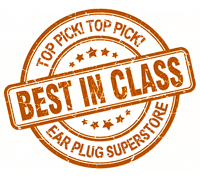 We have added a seal to indicate our top picks of Best in Class for a number of categories where there are so many products to choose from that it is easy to become confused. As you might expect from a company that has been in the hearing protection business for more than 17 years, we are asked each and every day for our advice and recommendations. We are happy to oblige, so please do reach out to us if you ever have questions, by phone, fax, email, or chat. We do not accept payment to apply the seal to the products of any manufacturer. We do not perform tests to verify the claims of the manufacturer. We do not apply the seal to our own brands of products, except when they really are the best in that category. The majority of our customers who contact us about the product tell us they like the product...even though there are always going to be some who do not like any given product...that is how life is. Customers return to buy more of the same product. The features and functions of the product are better in one or more ways than competing products, in our opinion. We hope you like this feature, and that it provides you with some help when you are undecided. We rely on our customers to tell us what you like...and what you do not, so either way, please feel free to get in touch.